Nigeria's Boko Haram jihadists have killed five civilians and two soldiers in fresh attacks in Cameroon and Chad, local sources said Thursday. "A group of Boko Haram fighters made an incursion during (Tuesday) night in Assigashia," a source close to administrative authorities in the northern Cameroon border area said, asking not be named. "The attackers killed five people and wounded five more." The raid was confirmed along with the casualty toll by an official in the Cameroon security services. Assigashia is a border town which gives direct access to Nigeria and has seen many Boko Haram incursions in the past. The Nigerian jihadists are blamed for killing another civilian in the town in January. In Chad, meanwhile, two Chadian soldiers, including a captain, were killed in a Boko Haram ambush on Wednesday, a senior military official said Thursday. 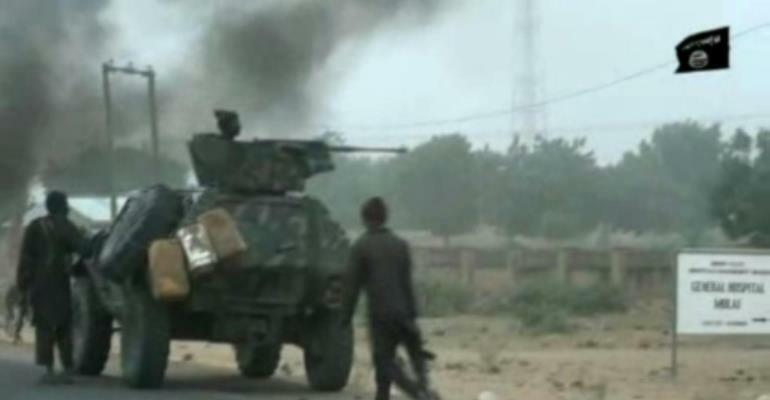 The attack took place in the west of the country in the Lake Chad region near the Nigerian frontier as the troops were returning from a border patrol. "The Boko Haram attackers disappeared into the islands" on the lake, the source said. Since 2014, the year Cameroon began to fight Boko Haram, the group has killed 2,000 civilians and soldiers and kidnapped about 1,000 people in the region, according to an analysis by the International Crisis Group (ICG) think tank. Boko Haram, a militant movement opposed to Western influence and seeking an Islamic state based on Sharia law, has caused the deaths of at least 20,000 people since it took up arms in 2009. Cameroon, Chad and Niger have all joined the military effort by Nigeria to crush Boko Haram.